Bayonet style bulbs such as 1156, 1142, 1157. Single contact dual pin. Dual contact dual pin type bulbs. 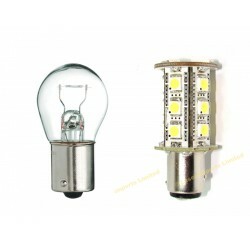 1x 1142-2W led bulbThe bulbs feature a ceramic heatsink for maximum output and cooling..
You are buying 1x standard bayonet house bulb fitting for use on 12v and 24v systems in caravans.&nb..